The other day whilst driving past a vergeside collection I saw what appeared to be a newish microwave in good condition. So I pulled over, plugged it into the 240V inverter I have in my ute, and it appeared to work oK. So I took it home, but when I plugged it in and tried it, the circuit breaker tripped. What gives? Sounds like a problem with the earth leakage. Appliances must normally complete a circuit between "active" and "neutral". A connection is also made from the appliance to earth, this being to ensure that if a fault occurs to exposed metallic (conductive parts) that the voltage on those parts is "0 V" or earth. If you did not have this, then a fault could expose you to electric shock if the exposed metallic parts became "live" and you happened to complete the circuit to earth (where the neutral eventually connects) via anything else including such like as leaning on the stainless steel kitchen sink, presuming there is a connection between it and the main mass of the earth. Now your truck based inverter probably (99.9999% !) did not connect to the main mass of the earth, and so any exposed metal that is "live" "floated". That is, the inverters definition of 0V is anywhere you like and not the main mass of the earth. Under these conditions, if you have a path from "live" to you to earth, this "live" point simply "assumes" 0V and shifts the other voltage to suit. This is of course conceptual, nothing else happens until you make contact with that other voltage point at which point you may become fried steak. As it turns out, because of inductive and capacitive effects, you can have an "earth leakage current" of up to 30mA under normal operating conditions, but once this low figure is exceeded, an earth leakage breaker will trip. Otherwise known as residual current breakers, these have been mandatory on domestic installations since about 1988 or so. I suspect that it was your earth leakage that tripped rather than the power circuit breaker tripping on excess, including short circuit, but a "solid" earth fault could do this. At the end of the day, I would recommend cutting the appliance plug off with sidecutters and returning the appliance to the collection point. Just a quick edit about the causes of earth leakage current, probably the main contributor here is simple insulation breakdown. A classic case is with electric frying pans where the plug/socket should not be immersed in water. The electric heating element is encased in a mineral insulation. If moisture gets into the insulation, it breaks down. The minimum allowable insulation resistance for these heating elements is 10,000 ohms usually measured with an insulation resistance tester (who remembers the wind up Megger?). Above 30mA of leakage current, as said trips the earth leakage. I like the picture, it gives me ideas. Personally I've done it before by just glueing or shoving a stick in, but the spring is great. 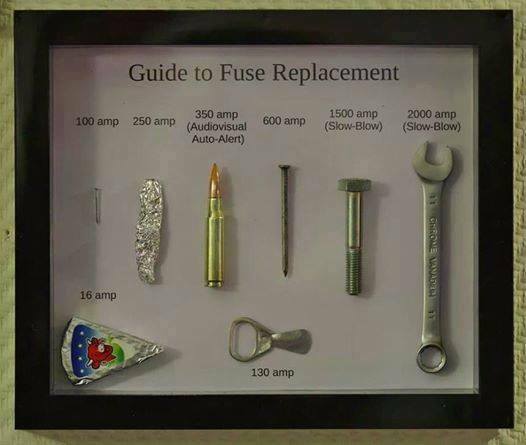 heres one for an expert on electronic stuff. a year or 2 i got solar panels shoved on my roof. the installer is actually a level 2 electrician. after that though my welder played up. as if it wasnt getting enough power. a week or 2 later he got the installation checked by the certifier, the certifier made him shove the cable from the panels to the box, which is inside the wall, inside a conduit, which he done. after that the welder works fine again. how did the cable being inside a conduit affect the function of the welder. Putting cable inside the conduit has done nothing as such. In doing that job though, something else has been tidied up and solved your problem. But to get the cable inside conduit, at least one end of the cable terminations had to be undone and re-terminated.